Trading with binary options does create many opportunities for traders. Not only does it allow traders to take advantage of expiry time variations as a trading strategy, binary options facilities that support the implementation of trading with various instruments, can also be used as a trading strategy. Trading methods by utilizing the types of instruments in binary options are referred to as knock-on effects or market pull strategies. The strategy is based on the idea that a price movement on a particular instrument will affect the price movements of other instruments. The knock-on effect method can also be said as a hedging development because it is done to cover options that will end out-of-the-money. This strategy allows traders to add options to an instrument, which is done as an effort to anticipate trading failures from the first option. For example, Si Unyil added the "put" option for the EUR / USD pair which is currently experiencing a downtrend because the first option is placed in the "call" position. The option will definitely end out-of-the-money if it is not overcome by hedging. If usually a hedging strategy is done with one currency pair or with another currency pair in a forex instrument, the knock-on effect strategy is applied by relying on the correlation between instruments. Thus, the hedging strategy that applies the knock-on effect method requires deep knowledge of the character of various different instruments. To be able to apply this strategy correctly, you need to understand the relationships between instruments contained in binary options. Don't worry, here you are not required to study each choice of instruments found in your binary options broker. To learn about the correlation between instruments, let's take the 4 most commonly traded instruments in binary options, namely forex, stocks, commodities, and stock indices. Broadly speaking, almost every commodity value is connected to the US Dollar. As for stocks, you can study the relationship between the movement of shares of the company you choose and its effect on the value of the stock index that shelves it. 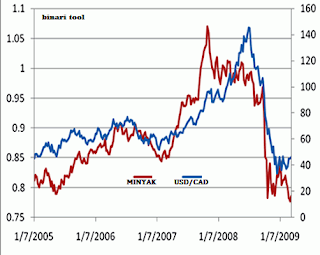 Briefly, here are the correlations between several instruments you can use with the knock-on binary options strategy. In this case, you can trade gold together with USD / CHF. This pair is chosen because 25% of the circulated Swiss Franc is reserved in gold. In addition, you can also take advantage of the correlation between gold and AUD / USD created by Australia's status as one of the main exporters of gold in the world. The trading opportunity of the correlation between gold and USD / CHF can be realized by placing the opposite option. 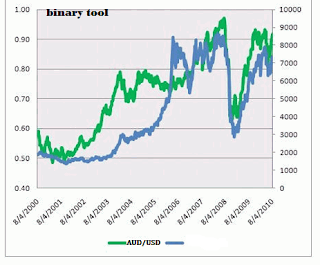 As for gold and AUD / USD can be traded with the same options. Thus, you can earn profit from the two instruments you are trading, or place the second option in the appropriate direction based on the correlation of gold and USD to anticipate a trading failure on the first option. Canada is one of the largest oil exporting countries in the world. Therefore, CAD has a positive correlation with oil values. From here, you can use trading opportunities by opening the opposite option between oil and USD / CAD. By observing the development of the Chinese economy, you can predict copper price movements that are following China's economic growth. When China's economy experiences growth, demand for copper will increase, and so does the exchange rate of AUD against USD. But when the Chinese economy contracted, the decline in the value of copper will also be accompanied by a weakening of the AUD / USD. This happens because the amount of copper demand will also decrease. Some stocks of well-known technology companies from the US such as Microsoft, Apple, Google, or Facebook have a positive correlation with the US Nasdaq stock index. That is, if the value of the shares of one of the companies rises, the increase will also contribute to raising the Nasdaq value, which is indeed a technology-based stock index. In this case, comparing the value of Apple shares with Nasdaq will further increase the potential profit because Apple is a major contributor to the overall value of the Nasdaq. The utilization of trading opportunities from the similarity of the correlation between the stock and the stock index is to place the same option. For example, if Apple has just released corporate earnings data for the second quarter, you can get ready to place options on Apple stock instruments and the Nasdaq stock index. If the result is positive, you can place a "call" option on both instruments. This method can also be a promising alternative to hedging if you place the wrong option before the Apple data is actually released. This error can occur because the results of the released data may differ from market expectations. Therefore, if the prediction states that Apple's income statement will decrease and you put the "put" option because of that, you can cover your loss by placing a "call" option on the Nasdaq index. This method is done by noting that the expiry time of the second option will bring the option to an end at the same time as your first option. Trading copper values ​​can also be related to the stock index value, precisely the Shanghai stock index. Because copper prices are in line with China's economic growth, the copper value and the Shanghai stock index will have a positive correlation. Some examples of the correlation above are general examples that you can use to apply the knock-on effect to trading binary options. There are still many correlations that can be found in binary options instruments. The movement of the US Dollar is generally contrary to commodity prices, because the position of the USD as a benchmark currency and its use in every world commodity trade. If the Greenback value weakens, the cost of purchasing commodities will decrease, and automatically generate investor purchasing power. But if the USD strengthens, demand for a number of commodities will decline as commodity prices increase. You can decide for yourself which instruments have the most promising relationships to apply to this strategy. The key is to understand the characteristics and patterns of price movements in the instruments you choose, and get used to trading with each instrument within a certain period of time. You also need to make sure that you really understand and are able to take advantage of volatility in the instrument market. This method can be done by practicing on a binary options demo account. Understanding of trading instruments used must be done in depth. Not all instruments that have a positive correlation will move in the same direction in all situations. Likewise instruments that have a negative correlation, also will not always move opposite with the same correlation value. For that, you have to really know when an instrument will respond to the price movements of other instruments in accordance with the correlation, and how much probability the correlation will be fulfilled. This process of understanding may take a lot of time and seems a bit difficult, but this is not an impossible thing to do. If you can understand and get around the relationship between instruments and apply that knowledge to the knock-on effect strategy, the opportunity to increase profit opportunities will be more wide open. Choose expiry time long enough to be able to do hedging. This tip is suitable for those of you who study the correlation between instruments as a way to anticipate loss from one option position. First, make sure if the expiry time on the first option has enough time to allow you to set the second option, to end at the same time as the first option. This is important, because market volatility does not guarantee prices will be on the same trend continuously. To anticipate the occurrence of price movements in the opposite direction after the first expiry time option runs out, then you should arrange for the two options to expire at the same time. Balance your technical and fundamental analysis. Here, you cannot just prioritize one type of analysis. Both technical calculations and fundamental observations both have a significant effect on the success of this strategy. Besides that, listening to the development of news and economic data relating to trading instruments will greatly help you in listening to the relationship between instruments. Choose familiar instruments to trade and you can master their understanding. Every trader is free to choose the instruments he likes in binary options. If you have previously been very familiar with one type of instrument, then develop a knock-on effect strategy that relies on that knowledge. You don't have to follow suggestions that promote opportunities for profit from certain correlations if you don't really master them. Keep following the trading plan and choice of instruments that are familiar to you, because maximum results will be more easily achieved if you have mastered the terrain. A deep understanding of the market, characteristics, and price movements in the instrument have a huge contribution to the success of trading. Every trader involved in binary options will be interested in developing his trading on a selection of instruments that can be traded. You can maximize that interest by developing a knock-on effect strategy, so that the profit opportunities on your trading can also increase. Utilizing a binary options facility that allows you to trade on several instruments at once, indeed it will require a learning process that is not brief and high discipline. But you will benefit even more if you can master this knock-on binary options strategy. In addition to increasing profit opportunities, you will also have extensive knowledge regarding the instrument market of your choice. With your ability to understand trading on more than one type of instrument, you will become a more reliable binary options trader in the field.